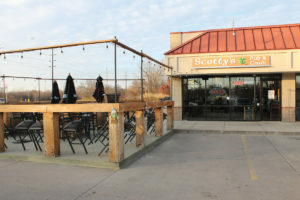 Tucked in a strip mall in a quiet West Des Moines neighborhood, Scotty’s Pub & Grub beckons suburbanites to travel or bike a few miles for tasty bar food and drinks. The pub is just off EP True Parkway and located on the opposite side of the Jordan Creek Trail. Bar owner Scotty Thomas opened it one year ago. He named it after himself, but mostly in honor of his son, Scotty, Jr. Inside, his kids’ influence is evident. A Valley High School football jersey and a cheerleading jersey from his kids, Scotty and Suzy, hang on the walls. A burger is named after his other child, Sloan. Scotty’s offers patrons clad in Valley gear a discount on Friday nights. The pub is a popular gathering place before and after Valley games. During warm weather, the patio is home to live music. Other specials include a Wednesday night steak night. Tacos on “steroids” are a dollar off, served Tuesdays and Thursdays — the same tacos served at Ankeny’s Yankee Clipper’s taco night. About a dozen tables and a long L-shaped bar offer an intimate setting inside with knotty-pine wood décor and a semi-open kitchen. Scotty says his open kitchen reminds him of when, as a child, he’d sit at the counter stools at George the Chili King and see the cooks at work. “An open kitchen, you can watch them cook and know they’re not hiding anything,” he says. An Irish-inspired menu is offered at lunch and dinner, with breakfast on weekends. A breakfast pizza can soothe a hangover, or you can continue with a bloody mary bar special. On a recent Thursday evening, NFL teams played on the tube, while regulars sat around the bar. Aaron Sewell sipped on a cocktail while waiting for his takeout order. He stops in often, citing the good location. “The staff is friendly and fun. It’s a good meeting place for my friends. I have one friend that lives in the West Glen area and one that lives in Valley Junction; it’s a good halfway meeting point,” he says. Menu items, as well as his specialty pizzas (with his secret sauce), are available for delivery with Uber Eats. Scotty says his grandparents formerly operated Jim’s Pizza Parlor in Huxley. His family spent holidays eating pizza together, which influenced his decision to open up Scotty’s with help from his kids.